“Tree Full of Friends” is the perfect toy for busy little hands. 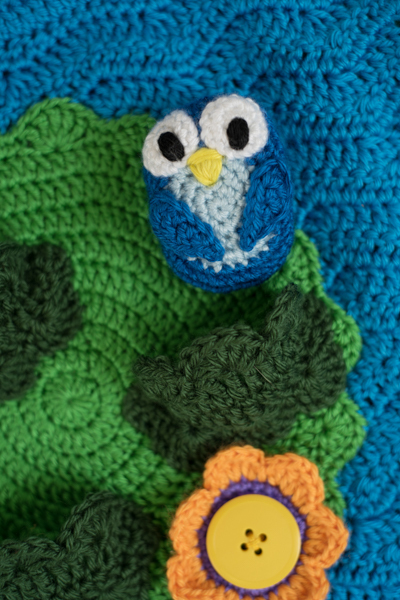 This 20″ x 24″ crochet wall hanging of a tree against a bright blue sky includes several pockets on the tree in which to tuck an amigurumi owl, bluebird, and squirrel. Children will enjoy popping the flower petals onto oversized buttons on stems and in the tree. 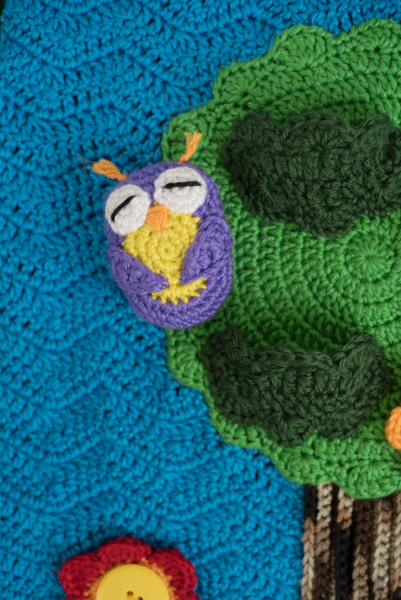 This colorful toy, which also doubles as a children’s room decoration, offers a great opportunity to use up stash yarn. 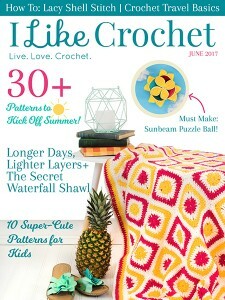 We are making this wall hanging over the course of three issues, and in this second installment, we will cover crocheting the owl and bluebird amigurumi. Caron Simply Soft Solids (100% Acrylic; 315 yards [288 meters]/170 grams): Royal Blue (A), 1 skein; Grape (B), 1 skein; Lemonade (C), 1 skein; Soft Blue (D), 1 skein; White (E), 1 skein; Mango (F), 1 skein; Black (G), 1 skein. Caron Simply Soft Solids (100% Acrylic; 315 yards [288 meters]/170 grams): Lemonade (C), 4 yards; Grape (B), 17 yards; Mango (F), 2 yards; White (E), 4 yards; Black (G), 1 yard. Rnd 1: Work 6 sc in 2nd ch from hook, do not join – 6 sc. Rnd 2: Work 2 sc in each sc around, join with sl st to first sc – 12 sc. Rnd 3: Ch 1, *sc in next sc, 2 sc in next sc; rep from * 5 more times, join with sl st to first sc – 18 sc. Rnd 4: Ch 1, sc in next 2 sc, 2 sc in next 4 sc, sc in next 5 sc, 2 sc in next 4 sc, sc in next 3 sc, join with sl st to first sc – 26 sc. Rnd 5: With B, ch 1, sc in next 2 sc, *2 sc in next sc, sc in next sc**; rep from * 3 more times, sc in next 5 sc; rep from * to ** 4 times, sc in next 3 sc, join with sl st to first sc – 34 sc. Rnd 6: Ch 1, sc in next 2 sc, *2 sc in next sc, sc in next 2 sc**; rep from * 3 more times, sc in next 5 sc; rep from * to ** 4 times, sc in next 3 sc, join with sl st to first sc – 42 sc. Rnd 7: Ch 1, sc in next 2 sc, hdc in next 2 sc, dc in next 8 sc, hdc in next 2 sc, sc in next 2 sc, join to next st.
With B, rep Rnds 1-7 of Owl Front. 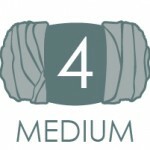 Do not break yarn at end of Rnd 4. Rnd 2: Work 2 sc in each sc around, join to first sc – 12 sc. Using a 2-foot length of black yarn and tapestry needle, embroider a line across each eye to make it appear that the Owl is sleeping. Tie off at the back of the eye and trim ends. Row 1: Tr in 5th ch from hook, tr in next ch, dc in next ch, hdc in next ch, sl st in next ch. With RS facing out, use long tail to sew Front and Back of Owl together. When you are about 3/4 of the way around, stuff Owl lightly. Finish sewing two sides together. Weave in end. Sew Eyes to Front. With a 2-foot length of F and a tapestry needle, embroider Beak between the eyes. Sew Wings to Owl Front. Thread the long tail from one wing onto a tapestry needle. To create a point at the tip of the wing, begin by threading this tail through the starting ch from front to back. Weave in other end. Use the rest of the long tail to sew the Wings to Front of Owl. Thread a 6″ length of F through any pair of stitches above one of the Eyes. Tie this in an overhand knot. Repeat with another 6″ length of F above the other Eye. Trim both Ears to about 1/2″ long and rub them against your palm to fray the ends a bit. Rnd 5: With A, ch 1, sc in next 2 sc, *2 sc in next sc, sc in next sc**; rep from * 3 more times, sc in next 5 sc; rep from * to ** 4 times, sc in next 3 sc, join with sl st to first sc – 34 sc. With A, rep Rnds 1-7 of Bluebird Front. With a 3-foot length of G, embroider the pupil in the center of Eye, toward the bottom. One easy way to do this is to come up through the center of Eye and down through any stitch of Rnd 2. Repeat, coming up and going down through these same holes, until the pupil achieves the desired thickness. Tie off at the back of Eye and trim ends. With RS facing out, use long tail to sew Front and Back together. When you get about 3/4 of the way around, stuff Bluebird lightly. Finish sewing two sides together. Weave in end. Sew Eyes to front. With a 2-foot length of C and a tapestry needle, embroider a Beak between the Eyes. Sew Wings to front. Thread the long tail from one Wing onto a tapestry needle. To create a point at the tip of Wing, begin by threading this tail through the starting chain from front to back. Weave in other end. Use the rest of the long tail to sew the Wings to the Front of the Bluebird.